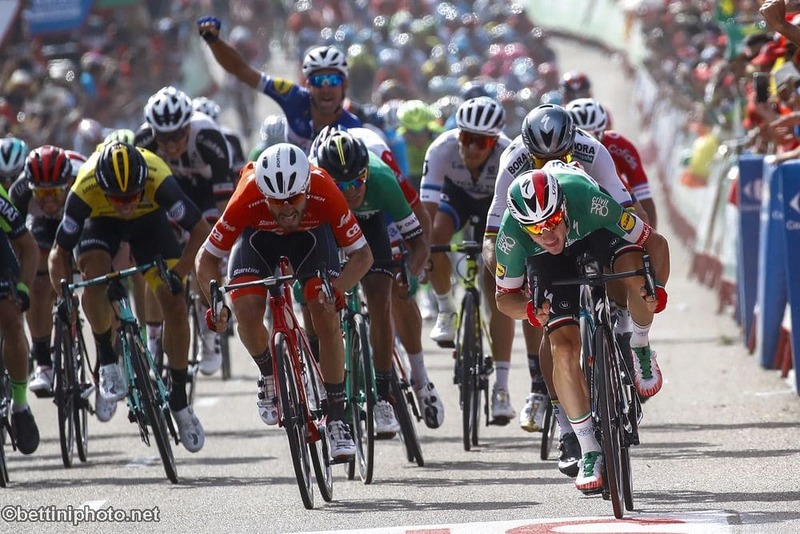 Elia Viviani thanked his teammates for a perfect lead-out that saw him win a second stage on this year’s Tour of Spain on Tuesday, as he clinched a bunch sprint ahead of world champion Peter Sagan and Giacomo Nizzolo. After a flat run from Salamanca to Bermillo de Sayago, Viviani, wearing his Italian tri-color jersey, added to his triumph on stage three last week thanks to a clinical lead-out and sensational late burst of speed. This was an incredible 17th victory of the season for Viviani, who left Team Sky to join Belgian outfit Quick-Step, who target stage wins rather than podium places on the big tours. “That was just about the best lead-out from our team this year,” said the 29-year-old Viviani. “The guys did a great job, there’s a great deal of pressure to deliver and win when people see you as the fastest. You really don’t want to lose,” explained the man who wept when Sagan beat him in a sprint finish at the Gent-Wevelgem in March in his first race for Quick-Step. For Bora-Hansgrohe’s Sagan this was a third second-place finish, but as consolation the Slovakian leads the sprinters’ points classification. Briton Simon Yates of Mitchelton-Scott held on to the overall leader’s red jersey by a single second from 38-year-old Spaniard Alejandro Valverde, while his Movistar team leader Nairo Quintana in third at 14 seconds. Wednesday’s 11th stage from Mombuey to Ribeira will be run over hilly terrain in the region of Galicia featuring four medium climbs. 1. Elia Viviani (ITA/QST) 4hr 08min 08sec, 2. Peter Sagan (SVK/BOR) same time, 3. Giacomo Nizzolo (ITA/TRE) s.t., 4. Nelson Soto (COL/CJR) s.t., 5. Marc Sarreau (FRA/FDJ) s.t., 6. Danny van Poppel (NED/LNL) s.t., 7. Ivan Garcia (ESP/BAH) s.t., 8. Jon Aberasturi (ESP/EUS) s.t., 9. Simone Consonni (ITA/EAU) s.t., 10. Matteo Trentin (ITA/MIT) s.t. 1. Simon Yates (GBR/MIT) 41hr 03min 00sec, 2. Alejandro Valverde (ESP/MOV) at 1sec, 3. Nairo Quintana (COL/MOV) 14, 4. Emanuel Buchmann (GER/BOR) 16, 5. Ion Izagirre (ESP/BAH) 17, 6. Tony Gallopin (FRA/ALM) 24, 7. Miguel Angel Lopez (COL/AST) 27, 8. Rigoberto Uran (COL/EFD) 32, 9. Steven Kruijswijk (NED/LNL) 43, 10. George Bennett (NZL/LNL) 47. Selected: 11. Fabio Aru (ITA/EAU) 1:08, 16. Thibaut Pinot (FRA/FDJ) 2:33,18. Ben King (USA/DDT) 3:01.